Through Lady Jane's amateur theatre career, Lovejoy comes into possession of several rare 17th-century prints by political satirist James Gillray. He manages to turn them for a profit, but a disastrous installation in a client's home raises questions about their authenticity. Episode 2: Who Is the Fairest of Them All? Jane convinces Lovejoy to sell an 18th-century French mirror, rumored to be recovered from a shipwreck. But the second it falls into his hands, she begins avoiding him for strange reasons. In Jane's stead, Lovejoy is trusted to look over her home, now for sale. Never one to pass up an opportunity, he stages an antiques show, hoping the estate will lend the items value. This doesn't square well with Charlotte Cavendish, the hall's appointed auctioneer. 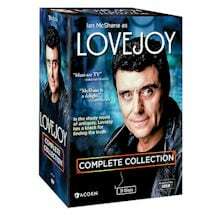 Lovejoy receives a rude awakening when a ruthless businessman, Sandy Litvak, calls in a PS14,000 debt that Lovejoy owes. He'll need to find a way to pay back the sum in five days or else face the brute force of Litvak's henchmen. Charlie Gimbert purchases an authentic 18th-century Beau figurine at auction. But when he shows it off, it appears to have been swapped for a fake. 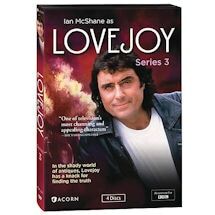 Lovejoy must now charm the withholding Charlotte to get to the bottom of the crime. Eric and Tinker go on a seaside vacation in Tollesbury but end up in the company of crooks. Meanwhile, Lovejoy is stranded with a giant Flemish dresser and subjected to the scrutiny of an overzealous detective. Lovejoy's infatuation with Charlotte grows stronger, but he upsets her by inadvertently allowing a thief to make off with an extremely rare and valuable apostle cross. The two must travel to Wales to recover it. Lovejoy agrees to appraise some paintings for Charlotte's friend, who runs a mental institution in financial trouble. But his presence there may not be welcome, as someone tries to take his life. A widow seeks Lovejoy's help in selling off her husband's eclectic antiques collection. Most of it is rubbish, aside from a large 15th-century Chinese gun from the Ming dynasty. To authenticate the item, Lovejoy and Charlotte will have to consult with dangerous experts. To pay off a dentist bill, Lovejoy agrees to track down an antiques dealer presumed to have fallen overboard from a ferry to Holland. Meanwhile, Charlie Gimbert begrudgingly puts on a dog show at Felsham Hall. An elderly carny looking to retire asks Lovejoy to sell his large collection of brass candlesticks. But when the man is arrested under the suspicion of stealing antiques from a wealthy town member, it's up to Lovejoy to clear his name. Two bizarre sisters contact Lovejoy, hoping their antique book collection will be their ticket out of debt. They do, in fact, possess a rare and valuable 16th-century Marston Bible, but Lovejoy will first have to convince their very reluctant brother to sell it. Lovejoy accompanies Charlotte to a class reunion, hoping for a romantic weekend. But the trip takes a turn when he's asked to appraise a taxidermied fish famous for swallowing Isadora Duncan's jewelry. To make matters worse, Charlie Gimbert serves him with an eviction notice. Lovejoy encounters a Southern belle from North Carolina who, oddly enough, shares his surname and penchant for exquisite antiques. When a trove of valuable artifacts once belonging to Sir Walter Raleigh goes missing, he travels to the United States to track her down.